Our brand new collection of Symphony Table Boxes brings elegant form to function. Select between 12 different color combinations, number of full insert AC outlets, USB charging ports, and low voltage openings. The Symphony Collections gentle curved shapes allow for large cable to bulkhead AV connections while maintaining aesthetics for interior demands. Important Details Symphony Table Box stocked model w/ 2 AC outlets, 1 Dual Charger, Aluminum housing, Black end cap, Black inserts. Important Details Symphony Table Box stocked model w/ 2 AC outlets, 1 Dual Charger, Aluminum housing, White end cap, White inserts. Important Details Symphony Table Box stocked model w/ 2 AC outlets, 1 Dual Charger, 1 Snap-In kit, Aluminum housing, Black end cap, Black inserts. 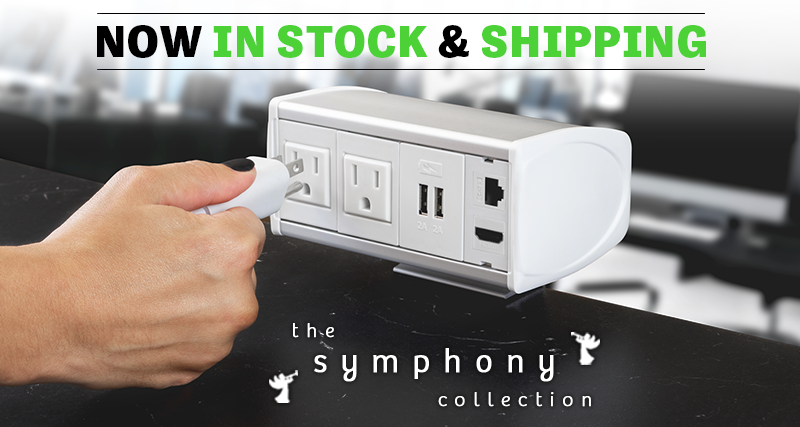 Important Details Symphony Table Box stocked model w/ 2 AC outlets, 1 Dual Charger, 1 Snap-In kit, Aluminum housing, White end cap, White inserts. 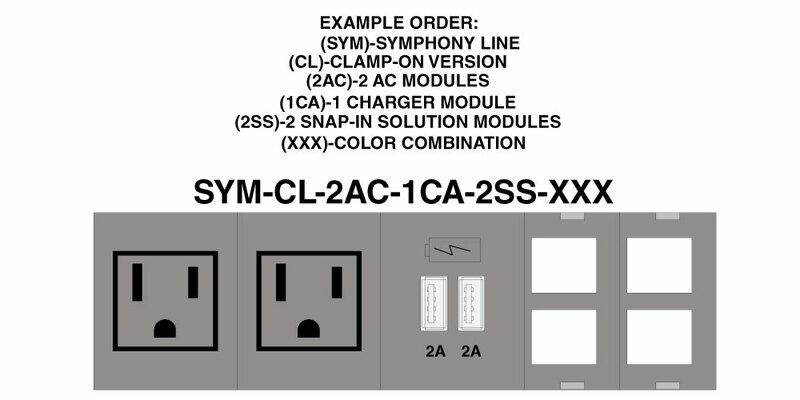 Configure a Symphony Table Box just the way you need it by using the ordering key below to build out the part number. Important Details Use the ordering table below to configure your table box. Clamp with 3 AC outlets, 2 USB-A Dual Charger, 1 Snap-In Kit; Alum Housing, White End Caps, Black Inserts. 5 AC and 2 Charger modules maximum.